The first winter cereals have already been harvested and spring cereals aren't far behind. I fielded a few calls last week with questions about heavy foxtail and barnyard infestations that will be troublesome with the harvest. The heavy pressure of these grassy weeds now is a direct consequence of the delayed planting earlier this spring and the warm weather than immediately followed. It allowed the foxtail and barnyard grass to emerge almost simultaneously with the wheat, barley or oats. Most other years the wheat, barley, and oat emerge well before the warm season grasses emerge and shade out any foxtail or barnyard seedling that emerge later. If no grass herbicide was applied this spring these small grassy weed seedling just hung on in the bottom of the canopy. Now that the wheat, barley, or oats have started to ripen, sunlight is reaching the bottom of the canopy again. As a result, the grassy weeds have started growing rapidly, thereby turning fields in tall, green pastures rather than amber waves of grain. To avoid turning your combine into a silage chopper, you have two options. You can swath the crop to dry down the grassy weeds or you can use pre-harvest glyphosate to kill the grassy weeds. Swathing or windrowing, at one time, was the default operation that signaled the beginning of harvest. However, swathing poses a risk, since grain in the swath is more prone to pre-harvest sprouting if adverse weather delays threshing. A second pre-harvest option for wheat and feed barley (but not malting barley, oats, or wheat and barley grown for seed) is an application of glyphosate at the hard dough stage. Research has shown that glyphosate applied with or without ammonium sulfate may hasten dry-down of the wheat crop if conditions for dry-down are adverse. With a pre-harvest interval of 7 days, a couple of days, at the most, may be gained. 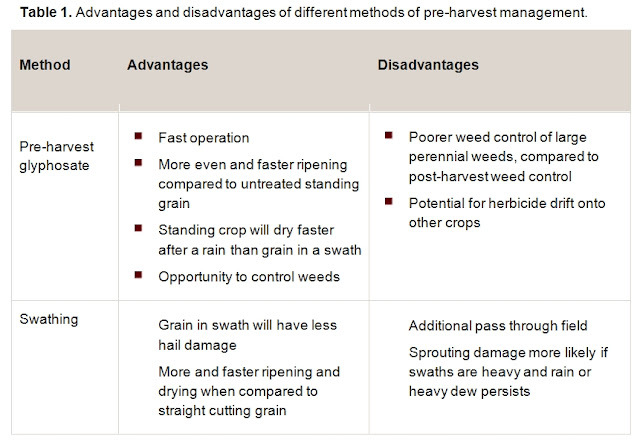 Table 1 summarizes the advantages and disadvantages of each of these pre-harvest management options. The optimum time for pre-harvest management is right at or just after the crop has reached physiological maturity (PM). This applies regardless of whether the grain is swathed or glyphosate is applied as a pre-harvest treatment. At physiological maturity, the crop has the maximum kernel dry weight and no additional dry matter will be deposited into the grain. Similarly, grain protein cannot be increased after PM through glyphosate applications or other management practices. The kernel moisture percentage at physiological maturity is relatively high and can vary from 20 to 40 percent. Research has shown that swathing just before PM does not harm grain yield or quality. However, this practice is not recommended when using glyphosate as a pre-harvest tool. There are two visual indicators that can be used to determine whether the crop has reached physiological maturity. 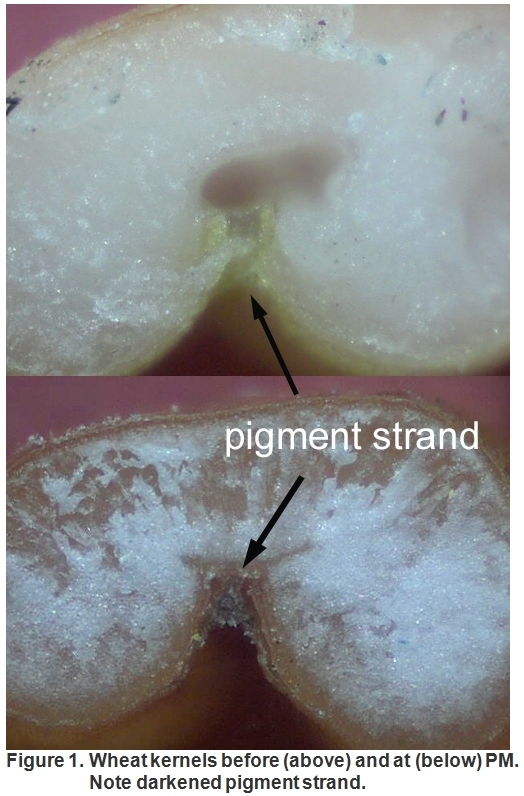 The first indicator is the loss of green in the kernel and the appearance of a dark layer of cells or pigment along the crease of the wheat kernel (Figure 1). Kernels in the same spike will reach physiological maturity at different times, with the middle of the head maturing first. Another visual indicator is the loss of green from the uppermost internode or peduncle. 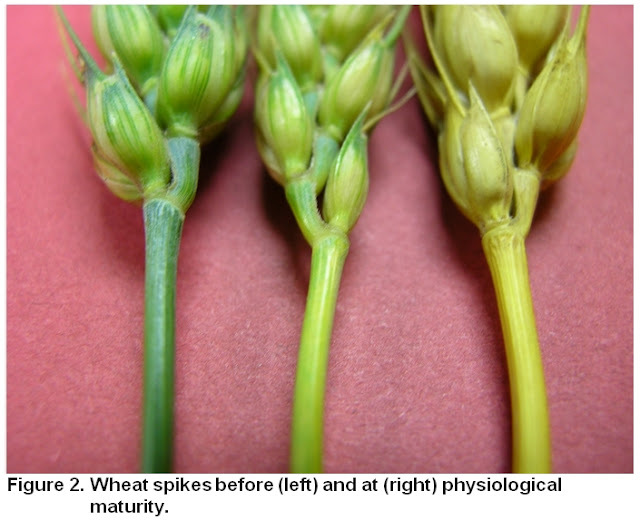 The uppermost portion of the peduncle, just below the spike, will have turned very light green or yellow at physiological maturity (Figure 2). At this time, transportation of water and nutrients to the head has been cut off and the crop has reached maximum grain fill. Swathing or applying glyphosate before the crop reaches physiological maturity will result in yield and test weight losses and green kernels in the harvested grains. The losses get progressively worse the earlier the crop is cut or treated. Research at North Dakota State University in spring wheat and durum showed that swathing the grain at 45 percent moisture caused 1 to 2 lbs. reduction in test weight and about a 10 percent reduction in grain yield. Swathing after physiological maturity increases the risk of shattering and will equally cause yield losses but no losses in grain quality. Shattering losses can be reduced by swathing in the early morning or late evening when some dew is present in the crop.